After hearing from Bob Hoover, it’s now time to hear from Kim Furst. 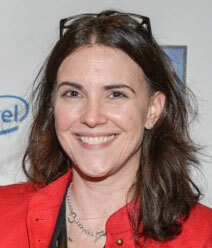 Kim wrote, directed, produced, and edited “Flying the Feathered Edge’. This movie about Bob Hoover’s life, condensed into a movie that is only a fifth the length it could be, is a tale of a true aviator. 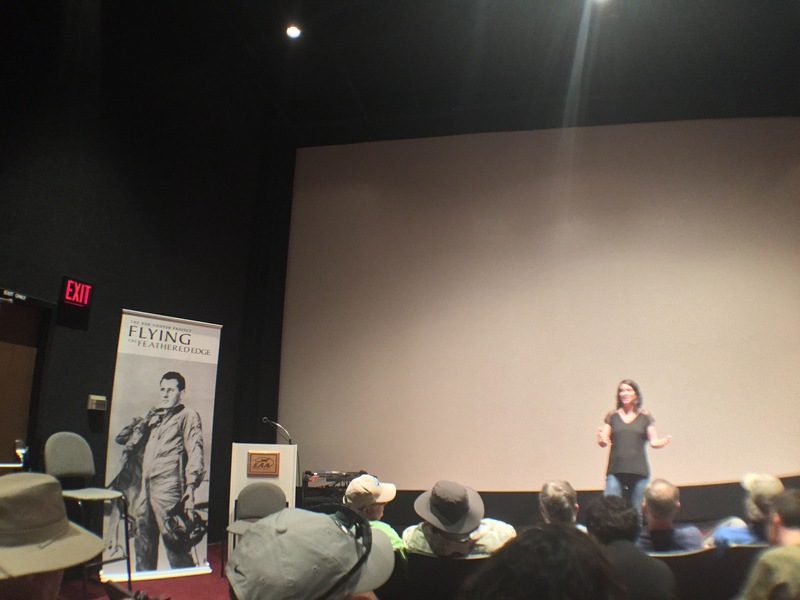 Kim talks about her reasoning behind choosing this project, how you can see the movie, some of the background story on working with Bob Hoover, Harrison Ford and Sean Tucker on the film. This film is truly a treasure in aviation. Find out how you can become a part of #TEAMHOOVER. Huge thanks to Kim for joining us, taking time from her busy schedule to talk about this wonderful film. Thanks a million, Kim! Keep up the awesome work. Chris: Welcome to another snippet episode of AviatorCast celebrating National Aviation Day. This is our third snippet 8-point roll episode. So this is where we are going to talk to the filmmaker, director, producer, editor and more I believe, of Flying the Feathered Edge: The Bob Hoover Story. 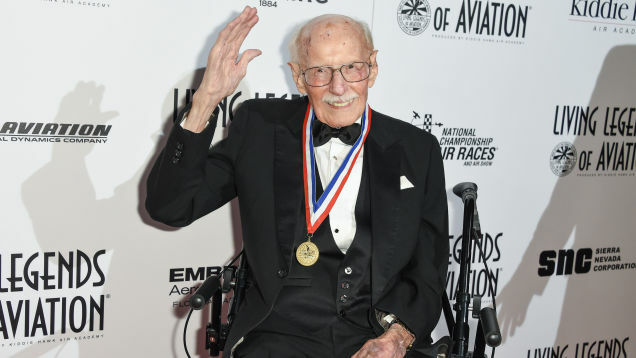 So this is kind of a life story of Bob Hoover, you heard from Bob Hoover in the last 8-point roll quick episode, and so now we’re going to talk to the filmmaker. Her name is Kim Furst. It was great to meet Kim. I spent a little bit of time with her in different situations from the press briefings to seeing the film at the theatre there at EAA and then having this nice sit-down chat with her. I really love the work that she has done on this film, and she has also been involved in other films as well. 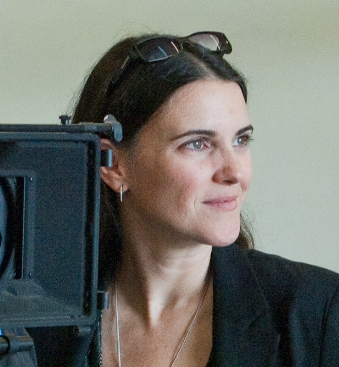 She was the editor of One Six Right which some of you may know of, and that is a great film as well. But this was an amazing show, so enjoy the interview but know that after the fact, I can tell you how you can see this movie and where you can see it, and so on. And so we will talk about that after this. So here is Kim Furst, producer-director-editor of Flying the Feathered Edge: The Bob Hoover Story. Chris: Alright everybody, we are honored to have a very special guest with us today. We have Kim Furst. Kim, tell us why you are here at Oshkosh. Kim: Well I’m here at Oshkosh because I’d probably be here at Oshkosh anyway. This is my seventh Oshkosh, and skipped a couple years but I’ve been coming since 2006 when I came with my friend Brian Terwilliger who had produced and directed a movie called One Six Right, I was the film editor on that picture so I worked closely with Brian for a year putting that together and it was probably one of the greatest things that I have had the opportunity to do, was sit and watch that in the screenings we did with the aviators here. We had two screenings that year in the eagle hangar of that movie. 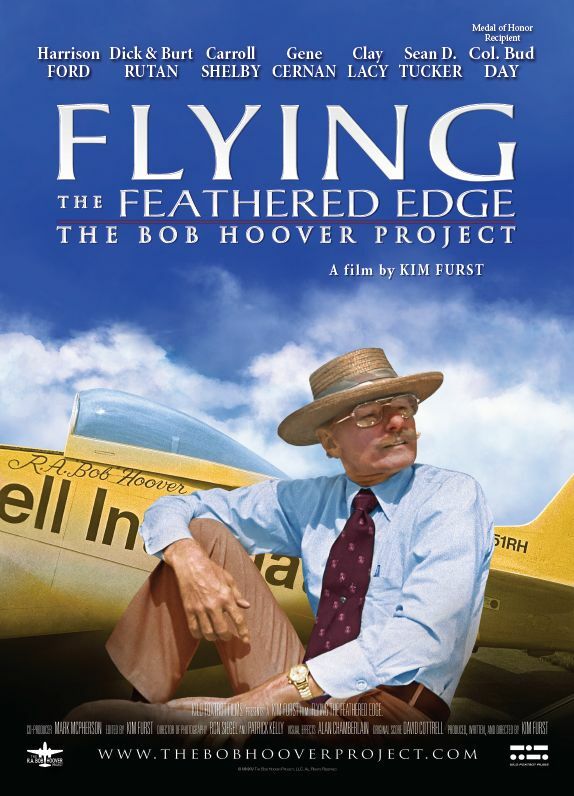 Anyhow, I’m here this year, it’s my fifth aviation documentary I’ve worked on later and I’m here with the movie Flying the Feathered Edge: The Bob Hoover Project which I produced, directed, edited and wrote, and it’s been an incredible week. We had a lot of events with Bob, a lot of things promoting the film this week, but I love Oshkosh. I’m actually really sad that it’s coming to a close. I was driving around the North 40, it’s Saturday and planes were already starting to take off. Anyhow, I’m just here seeing my aviation family. Chris: Great. Yeah. It’s a great time. 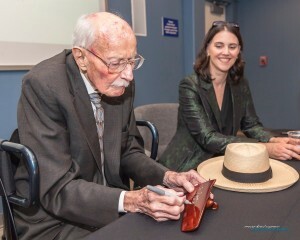 So, for those of you who know who Bob Hoover is, you listeners, you’re already excited about this because you had such a great opportunity to work closely to him. 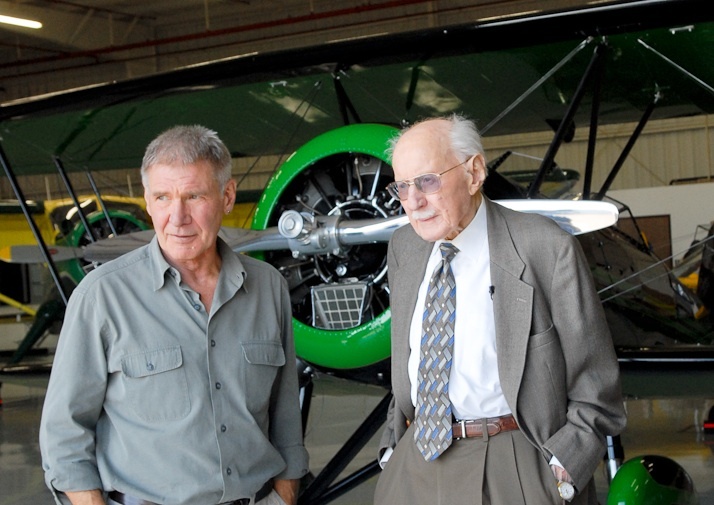 But for those that don’t know who Bob Hoover is, quickly educate us on this icon in the aviation community. Kim: Okay, so Bob Hoover, for anyone who might not know, is a World War II veteran. He was a pilot during World War II when he came out. Very storied events that happened there in his career when he came out of World War II. He was a test pilot at Wright Field. As an experimental test pilot, he then worked at North American Aviation which was very iconic American aviation company that designed the P-51, the F-86, the F-100, and many, many other things actually, Apollo programs. And then became a very accomplished airshow pilot. I mean, probably one of the premier airshow pilots through the 50s and 60s and 70s and into the 80s. So he had like a four-decade airshow career, demonstration career, demonstrated aircraft all over the world. He is known worldwide as probably one of our greatest living aviators. I think the Smithsonian Air and Space Magazine had a sentry of aviation edition where they listed the top 100 aviators of all time and I think Bob was number three. And the other two gentleman unfortunately are no longer with us so I guess by default that makes us at least by that magazine, that issue’s standing, our greatest living aviator. Chris: So if I’m not mistaken, one of the big reasons behind actually doing this film Flying the Feathered Edge, is to get Bob’s story to live on and that is largely why I wanted to do this podcast with you because I want to educate my generation, generation X, millennials on who Bob Hoover is. So over the last few days, I’ve been going to different events. I saw the movie. Wonderful, wonderful job by the way. Just really great. I can’t wait and tell other people to see it. And then other events where Bob could just sit there and talk his stories. So, yeah, I’m excited to talk about that a little more. So how did you end up coming across this opportunity to do this film for Bob? Kim: So, I had done, like I mentioned, I’ve been the film editor on four other aviation films and I’ve produced and directed other things on my own, and I was looking for a great story within aviation that I felt hadn’t been done yet in a way that I thought was befitting of his story or befitting of whatever story I was looking for at that time, and I got invited to this event by my friend Sean Tucker, who’s kind of the premier airshow pilot, right now flies the Oracle Biplane. And Sean said “I want to introduce you to the man who inspired me.” And we were at this dinner and it was probably 10 of us in the room, I was the only one that was not an incredibly accomplished aviator in my own right. 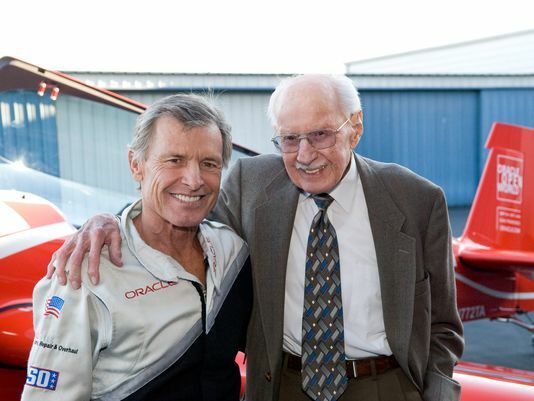 Chuck Aaron was there and other Boeing test pilots and people who were also legends, people who had also accomplished so much. And the way they look at Bob and how they revered him for what he had done to help keep them safe or say something that might have helped save their life in one time or another, I noticed that I was in the presence of someone who had an incredible, just database knowledge about aerospace and aircraft and airframes that others who are aviators who are pushing the limits of aviation may be experimental test pilots revered and the stories were just incredible. I mean, this is a guy who, it’s hard to imagine that one individual has done as much as he has done. One of the most famous stories is when he was a prisoner of war in World War II. He was captured, he was taken to Stalag Luft I on the Baltic Sea, and as the war was winding down, he finally managed to escape and get a nearby airfield and managed to commandeer a Focke-Wulf 190 and flew it to freedom in Holland. I mean, they’re just larger than life stories. But it all boils down to a man who is passionate about aviation. He is passionate about people being better aviators, good aviators, sharing his aviation knowledge, and in that way, he is kind of this national treasure as far as just aviation knowledge and there’s a lot of cultures that really honor their elders. Like I had spoken to someone who is Japanese who had seen it. Someone also from China who had seen the film and they were like “Bob is one of our tribal elders.” And for aviation, he has an incredible amount to give to people who are aviators. I think that’s why people love him and why they honor him like they do. Chris: That’s one of the reasons I again wanted to meet you because we talk a lot of those podcasts about not forgetting our kind of forefathers of aviation and so I recognize that he was one of them and needed to be recognized, and there’s still an opportunity for us in our day and age to learn about those guys and make sure we don’t forget where we came from. Because I think one of the problems we face in aviation, especially aviation training, is forgetting a lot of the tribal knowledge that we once had, and not only that but the inspiration. I actually heard that story from Bob. I was sitting there and he was doing his old yeller Warbirds in review down at Warbirds Alley. And he told that story and then he said that along the way, he would stop and he would encourage everyone to go for their dreams. That is just working hard and getting there. Kim: Absolutely. His is an incredibly inspiring story. That’s well put. Because he’s interested and inspiring people into aviation and just inspiring them to be professional, to be good at what they do, to use their own gut check, their compass on things but to be smart. And you know, there are certain events that I’ve witnessed over the time that I was able to spend with him filming it. During the time that he and I were working together, one of our interviewees who flies a Bonanza had an engine failure and he had to plant the aircraft between two trees and he did it like Bob Hoover had always said. Don’t stop flying the aircraft. Fly through. Never stop aviating. Never stop flying. He credits Bob for saving his life and frankly, Harrison Ford, Bob told me that he called him after his event in Santa Monica and discussed the event with Bob because he wanted to talk to him about how he did. And he’s that for pilots. I don’t know, did I answer your question? Chris: No, no, that’s great. Tell us a little bit what it was like to actually put the film together because obviously, there is a history from World War II all the way up to today really with what he is still doing. What was that like? I mean, how do we even approach a project like that? Kim: You’re putting your finger on what the biggest problem was with trying to get Bob’s story down to 90 minutes. So the first day, Bob and I got together to have interview, and I’ve interviewed quite a few people. I’ve done it professionally. I did all my research, I had read his book, Forever Flying which is fantastic book if anyone hasn’t read it. Highly recommend Forever Flying. That’s just a way to understand all the stories that Bob has lived through or I should say all the experiences that Bob has had. And we met day one, and by the end of that day, we had just gone through his time in World War II. And so I said “Okay, we’re going to have another interview day.” So I set up the next day. At the end of that full day, we had just gotten through his experiences that ended at his time at Wright Patterson. And we hadn’t even touched on is airshow flying, working at North American Aviation, Reno air races. By the time we were finished, my interview with Bob alone was 12 and a half hours. Kim: And I was asking him hard questions. I was not just letting him sit and talk. I knew I wanted to get some things out of him that I thought I had not heard before and I did. But I’m still hearing stories from him. I’m still hearing things last week that he’ll tell some story about being in China on a rickshaw and you know, what flying some aircraft over there in the Far East. Wow Bob, I’ve never heard that one before. It’s just kind of endless. So the biggest problem was trying to take a 12-1/2 hour interview and condense that down into something that’s 90 minutes long. And it’s not wall to wall Bob talking. It’s very important to me, as a filmmaker, I don’t like writing scripts like a narrator gives you the story that I think you should hear and have this preconceived idea of what the idea is about. For me, my goal is usually to start out by pulling the string, interviewing people, interviewing my subjects and finding out what is this story from their own words and then using their words to tell the story. So it meant a lot of me that I find a way to have Bob tell his own story because that’s how I wanted that tribal knowledge passed on. I wanted it from his lips to our ears and to really let him take us on his journey over his 70-decade career in aviation. And he’s got this great voice that’s very calm. He’s very charming and funny and that’s Bob. And as a film editor, you have a huge responsibility because I could cut Bob to make him very serious actually. Or I could say “Well, only the important stuff goes in.” But the thing I wanted to do was to almost like facet it like a diamond, like you think about. The diamond is Bob and I need as a filmmaker just put that, set it so that it shines as brightly as it does and not get in the way of it. Just let him be Bob. And he, Mr. Hoover is also telling stories that have incredible detail. This is a man who remembers names and places and these stories are extremely detailed, and from the get-go, he said “You know Kim, the most important thing to me is that it be accurate and that it be factually accurate. I don’t want anything in there that isn’t verifiable.” He wanted everything to be really precise. So when I was looking for, for example, he has these different stories like stealing the Focke-Wulf 190. You know, Bob might say “Well, I found there was a guy in the coveralls and there was a revetment, there was a Focke-Wolf.” Well, unless you’re going to sit there and have Bob just sitting on the screen the whole time, you have to find all that stuff. You have to find a photo that somehow represents, and you can’t just find any old Focke-Wolf 190. You got to make sure it was from, I don’t know, I’m not a professional about the Focke-Wolf 190 but I do know, like I’ve been reading aerospace magazines for years and you just don’t want to be that person that they’re referencing in the letters to the editor where well, that time it shouldn’t have an afterburner or gee at that time it should’ve been an F-86. That was the B model or the C model, not the D model. Chris: They wanted to help out. The community want together for Bob. Kim: We’ve been overwhelmed by the response of the community to help tell the story and to make it what it is. Chris: That just shows you the importance for everybody, and more so for the generations of that day, not necessarily for the generations of my dad because I’m young enough where I haven’t seen Bob in an airshow but just hearing his stories. Like this is the aviator of aviators. This guy is awesome. 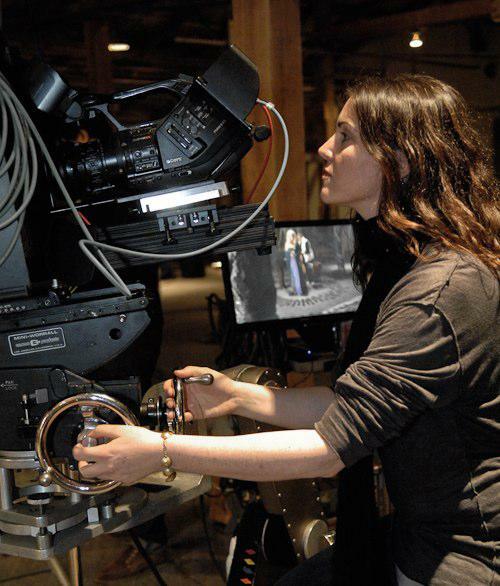 So how long did the film take you to make? Chris: Did you do that because of his age? Just so you could capture that right away? Kim: You know, frankly with all of these guys we lost, three of our people who are in the film during the making of the film, and I knew as soon as I want to do it that there was no time. I just wanted to get going. And it could happen to any of us at any time but there’s just no time to waste. So I did that and it’s funny because Bob is so vital that hopefully he’ll be here for another 10 years and we’ll be toasting the guy who’s 105 years old. You just never know with anybody. A young aviator that is important to the community who meant a lot to a lot of people who do offroad flying or John Kounis, 51 years old, and just something just completely medically related. So any of us, if you have an idea about something, don’t wait. Just do it. And specifically with these older legends. There aren’t a lot of them left who are from World War II. So that was in my mind for sure. So out of that interview, I realized that there were a number of things he said that kind of gave me idea of where I wanted to go next. We went together to, I followed him to the F-86/F-100 convention in Las Vegas, that was in 2011. These gentlemen were people that I had overheard in his interview Bob talked about were his heroes. People like Colonel Bud Day and Sam Johnson who flew, I mean, both of them became prisoners of war in Vietnam. Colonel Bud Day was I think five years in a French prison, sleeping on concrete. You can’t even imagine what they went through physically, but even just that, he remained with his spirit intact after all that is inspiring. So when we went to that event in Las Vegas, I started kind of just watching like a fly in the wall, just recording some of Bob’s speeches to the gentlemen that were there, and then also interviewing some of the gentleman who had watched him fly. When Bob was at North American Aviation, he used to do demonstration flights. His purpose was to show the F-86, the F-100, these were the aircraft that were the main fighters during the Korean conflict in Vietnam, and he would demonstrate these to the air force that were flying at the time to show them the capabilities of the aircraft, to basically show the limit of what an aircraft could do. So many of these gentlemen that were at these reunions remembered very clearly seeing Bob Hoover come to their air force base or their international guard unit or wherever they were stationed all over the world, and then he would put on a demonstration. Chris: In a suit and tie by the way. Kim: That’s right. He had very specific look. Bob always came, he wasn’t in an air force flight suit but he came in a suit and tie and put on these demonstrations. He was there to just answer any of their questions about safety. Bob is big on what would I do if and think about that and think about it ahead of time. So that was his message he was bringing, was what are the limits of this particular aircraft, how to stay safe, what to do if you were in these different, we have a beautiful film of Bob in a flat spin in an F-100 and it was a test that he did as an experimental test pilot to show that the F-100 would tend to, it doesn’t have very much vertical tail so it would tend to yaw and it could depart on you if you were doing certain maneuvers. So his job as an experimental test pilot at North American was to push it to the point where it departed because they were finding that these were finding that these were going into this flat spin and any aviator that’s actually spun an aircraft or whatever, there are certain things that aircraft generally do that you can regain control of the aircraft. But this particular one, you would get into a flat spin and you actually couldn’t get out of it. This was happening to some of these guys that were flying this particular aircraft and Bob went out there to talk to them about it. His message was always, and his interest was always how to keep other aviators safe. And he spent his career promoting that. So going to the F-100/F-86 convention was the next thing. Then we went to Reno. We filmed with Harrison and Sean D. Tucker in Harrison’s hangar at Santa Monica, which was incredible. Harrison was extremely gracious. I mean, he allowed me to come in to his hangar and move all of his aircraft around and direct him and Sean and Bob through a whole day he spent with us, talking to Bob and Sean and he loves aviation too and he wants to promote aviation and he said yes to this in between his busy schedule of doing huge blockbusters because it matters to him to get back to aviation. So we benefit from that. So all told, it took three years, I would say, three solid years, to structure and that includes the raising of the money part, and then also, I became pregnant during the process. My son is now three, and so a good deal of this, I found out when we were headed to Reno and I was running around Reno, carrying cameras and all these kind of stuff and at a certain point, I was told “You got to slow down.” But that was perfect for the editing process and I just had a big lazyboy and kicked it back and put my monitors up on the medical table, took some duct tape and strapped my keyboard on to the front of it, and I laid there big as a whale and cut the Bob Hoover movie. Chris: I’m sure you’re not going to share a picture of that happening. Kim: I actually do have a pretty great picture of that. Chris: Really? I want to see that. That’d be great. Okay, so we don’t have too much more time here left but there is this gem of a film now that we have about Bob Hoover’s life. So, how do we get the word out? How do we tell people about it? Obviously the first answer is get it in theatres, get in your local theatres, but also, how do we spread it to my generation, the social media, things like that. So let’s talk about, now we have this, what do we do? Kim: So, what we are about ready to do is release in theatres. We’ve actually been out on DVDs since the holidays so about five, six months, and there has been such a response, such a demand. I would like to share it with my young eagles group, I’d like to share it with my EAA chapter. How do we bring this to our museum? We’ve done huge screenings across the country. We did national museum at the USA air force, 800 people there. We just did something in Sacramento last weekend. We are at Embry Riddle for their alumni weekend, another 800 people saw the film that weekend. And what we just kept finding was aviators love to watch this movie together because it’s just so much fun and Bob is, he is really representative of our aviation history and our journey. He’s kind of touched so much of it. So it’s a very fun movie to see in groups of aviators. So what we have decided to do because of the demand is we are releasing in theatre next month. We’re kicking off on National Aviation Day which is August 19th. This day is a holiday which has been around since 1934. President Delano Roosevelt actually said that by presidential decree, each year we can celebrate Aviation Day and it’s to celebrate advancements in aviation. So I felt what a great opportunity to revive this somewhat little known holiday. Chris: I don’t even know about it. Kim: I have never heard of it either. Actually the only person I’ve talked to, there are two people who know about it, and the first one was Dorothy Cochrane, the curator of the Smithsonian. She said “Yes, of course I know about that.” So Aviation Day, we are going to be doing a screening on Capital Hill, in US capital. The screening is free but you do need to get your tickets in advance at the BobHooverProject.com, and we’ll have an event set up so that people can get their tickets and that will be kicking off this release in theaters. So theaters across the country will be carrying Flying the Feathered Edge. So if you live, anywhere you live across the country, you go to our website, you type in your email address and your zip code, and it will tell you where near you you can screen Flying the Feathered Edge. Then you buy your ticket, and then you tell all your friends to buy their tickets, and then you enjoy your screening. We are using #teamhoover and #teamhoover is our way to promote Bob’s legacy, his life, the film, bringing his story to the next generation. Like it’s not just those who served in Korea and Vietnam who respect and honor this database of knowledge, that he has this wealth, this foundation of wealth that Bob has. Actually let me put that differently. Bob’s whole generation, they were a different breed of pilots. Carrying that forward and building on that legacy is something that we believe will help future generations of pilots and inspire future generations of pilots. 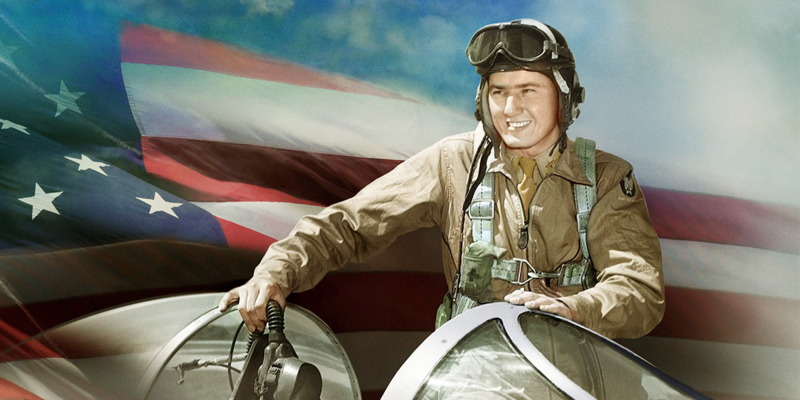 #TeamHoover indicates that you are on board with inspiring future generations of pilots by helping to spread Bob’s story and other stories like his. Chris: And that’s how I plan on using it, is when I feel particularly inspired about aviation, something that just gives me the chills or I that I feel so blessed to be doing what I’m doing, it’s a #teamhoover when I share that photo or that experience. I would encourage others to do that too and let’s get the spirit of Bob to live on because they aren’t going to be around forever and we’re going to look back on this and just treasure it completely, so now is the time to really start doing those things. Kim, any final words before we’re finished up here? Kim: Well thank you for doing this and for helping to bring attention to a story. We really appreciate it. Bob I think has been amazed by there is so much support for Bob but I think people have really been responding to this film and I think it’s exciting for all of us involved in it and things like social media are so outside of his understanding that I do say “Bob, here, come look at all of our Facebook posts. Like look, 2000 people liked this post.” And he is like “Oh, that’s really neat.” He just thinks it’s great. His birthday, it just blew up. You should scroll back and look at like his birthday. Chris: What’s his birthday? Do you remember? Kim: I should double check it. I know it’s in January. I want to say it’s the 22nd, 21st or 23rd. I believe it’s 22nd. And you know, people taking pictures of like birthday cakes that they made to him and pictures of everybody watching the movie to celebrate his life and I think it’s wonderful. It’s special for me to have the support because I really do feel like here is a way that I hope that people who haven’t seen him fly in an evergreen way for future generations can enjoy his story. Chris: And I’m a video guy myself. I love videos. Such an emotional way to show that, so fantastic job with the film. Those of you listeners, go out, check it out. If you can’t find it in your local theater, they can purchase it right? Kim: They can. 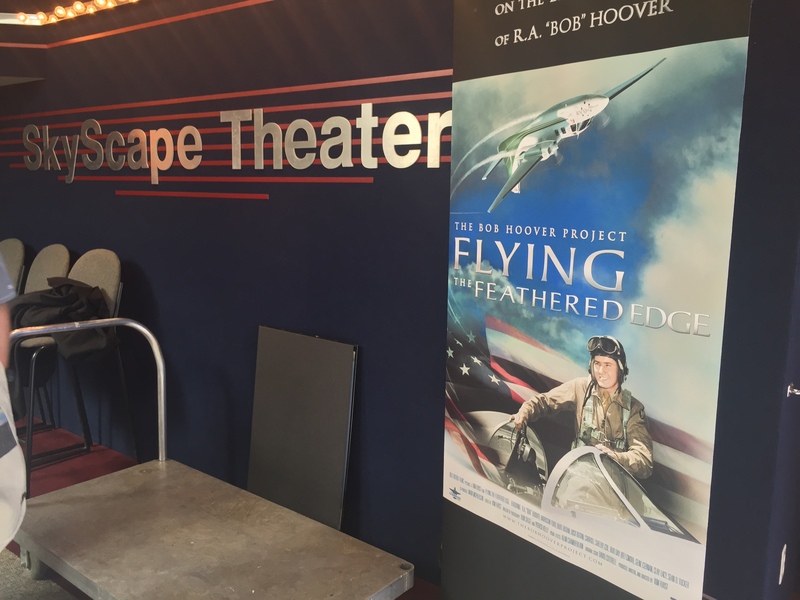 If you’re super, super, super remote and you want to go buy the DVD or the Blu-ray, you can purchase it from the BobHooverProject.com and Aviation Day, we’re kicking off screenings all over the country. We already have a whole bunch of them set up. Once you get your screening set up, we’ll promote it. We’re going to be promoting everybody across the country who is hosting Team Hoover screenings of the movies, so yeah. We look forward to having you part of Team Hoover. Chris: Alright, see you all then at the screening of Flying the Feathered Edge. Kim: Thank you Chris. Thank you so much. Chris: Alright, so that was such a great interview with Kim. 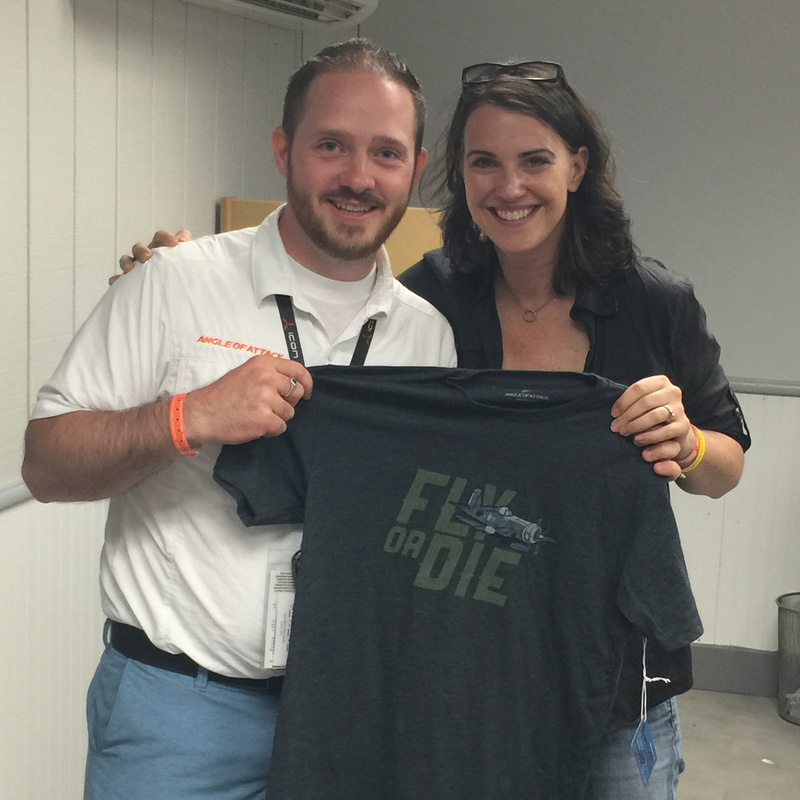 I was very happy to have been able to sit down with her on the last day that I was there at Oshkosh. It kind of wrapped everything together. She did such an amazing job with this film. I know that she did not do it on her own either. It was heavily influenced. Not even heavily influenced, it was all about the story of Bob Hoover and this guy is supported by such an amazing community. Almost everyone knows who he is, and then if you don’t know who he is, you should know who he is. This guy is just awesome. If you guys haven’t checked out the book yet, you need to. I’ve really been enjoying this. It’s one of the few aviation books that I just can’t get my head out of. I mean, from paragraph to paragraph, this thing just blows my mind as far as what Bob went through and what he experienced and I’m just in the first fifth or so of the book. So, amazing, amazing things. And a lot to learn as well. If you guys would like to see the movie which I highly, highly recommend you do, it is such a great representation of Bob’s story. Go to the BobHooverProject.com and you guys can check out there where you can go and see the screenings. You can also request that your local theater hold a screening and you may even see that there are some other screenings that are going to be happening in your area. So, be absolutely sure that you go there and you check it out because it may already be playing in your area. So go and check that out, and if you are totally unable, like say that there’s not even a theater in your town or anything or you’re not going to be able to see a screening of this, you can also purchase the film already on DVD or Blu-ray and that’s definitely something that I’m going to be doing here coming up. So you can do that and then you can interact with the Bob Hoover Project on twitter and Facebook. They have some pretty good channels there. They keep active on there. And if you want to become part of Team Hoover and if you are an aviator, you should become a part of Team Hoover, go ahead and use the Team Hoover hashtag on twitter, and I’m sure you could use them on Facebook too but use them on twitter #teamhoover. I usually do it all caps and I do that when I’m really inspired by aviation, when I feel like an aviator and I’m so proud to be a part of this. I do a Team Hoover hashtag. You should as well. I hope you guys enjoyed not only the last 8-point roll quick episode here but also this one, following up with Kim who did the film. I really recommend you guys go see it, and that’s it, let’s get into the next snippet episode here, the next 8-point roll and we’ll see you there. Until then, throttle on.